Daily chart says that the biggest GOLD PRICE drop came after closing time in London, i.e., midnight Eastern (4 hours behind London), from $1,100 to $1,094.50. The gold price traded flat until New York opened. About 9:00 it gapped down to the near the day’s low, $1,088, reached back up to $1,092.50, then dropped to the low of $1,085.60 about 11:30. Off that low it climbed back to $1,095, but ended Comex at $1,091.40, down $12 (1.1%). That took gold’s RSI back to 19.44, down from yesterday’s 21.16 but up from Monday’s 18.46. Monday GOLD PRICE punched through that 3 Standard deviation lower Bollinger Band. That sort of touch is usually good for triggering at least a little relief rally, but hasn’t done anything yet. 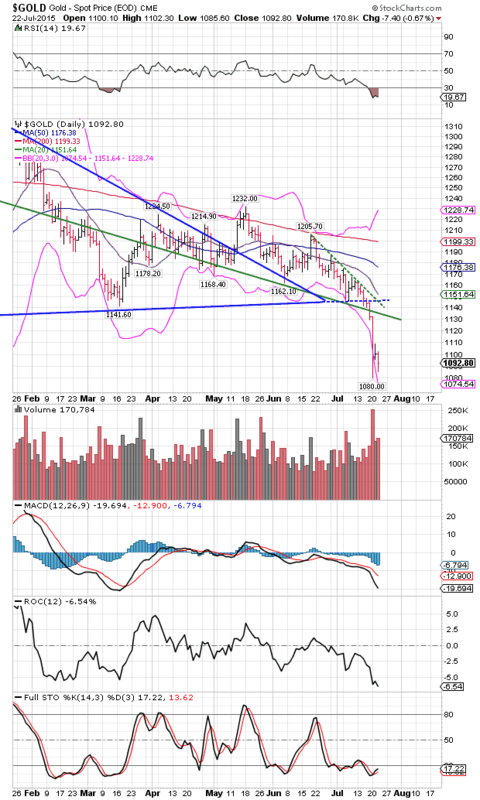 The gold price needs to post some convincing reversal sign. The SILVER PRICE chart diverges from the gold price chart right plainly. First, on the five day chart, silver’s low occurred on Monday (before New York Trading). The rest of the week has been flat. Today’s high reached $14.86, the low only $14.59. Silver lost 5.5 cents today (0.4%) to a Comex close at $14.714. Yet silver has still given no unequivocal witness of turning up. The GOLD/SILVER RATIO dropped again today, down 0.72% to 74.174 ounces of silver to one ounce of gold. This is three days below the 20 DMA (75.14) and post-2011 uptrend line and not much higher than the 50 DMA (73.40) or 200 DMA (73.09). This falling ratio makes little sense unless it is telegraphing a coming upturn in metals. Remember: these shenanigans only work at the margin, and passingly. Manipulators can’t alter primary market trend, and if silver and gold weren’t already weak and trending downward, these tricks would hardly work at all. Feels like being in a prison camp. As long as they have you in the camp, you can’t hit the guards, but one day, one day, you’ll get out. It will be payday someday. Stocks lost ground again. Dow backed up 69.42 (0.39%) while the S&P50 crawfished 5.19 (0.24%) to 2,114.02. That leaves the Dow below its 50 DMA (17974.80) and 20 DMA (17851.04). S&P500 remains above both. Dow Composite never rose as high as the 200 DMA in this recent rally, and turned down 4 days ago. Nasdaq Composite and 100 appear to have turned solidly down. US Dollar Index regained 24 basis points (0.25%) to close at 97.67, but this is like unbreaking eggs. Once you break an uptrend, the correction has to complete itself before another upleg can begin. Two days ain’t enough. 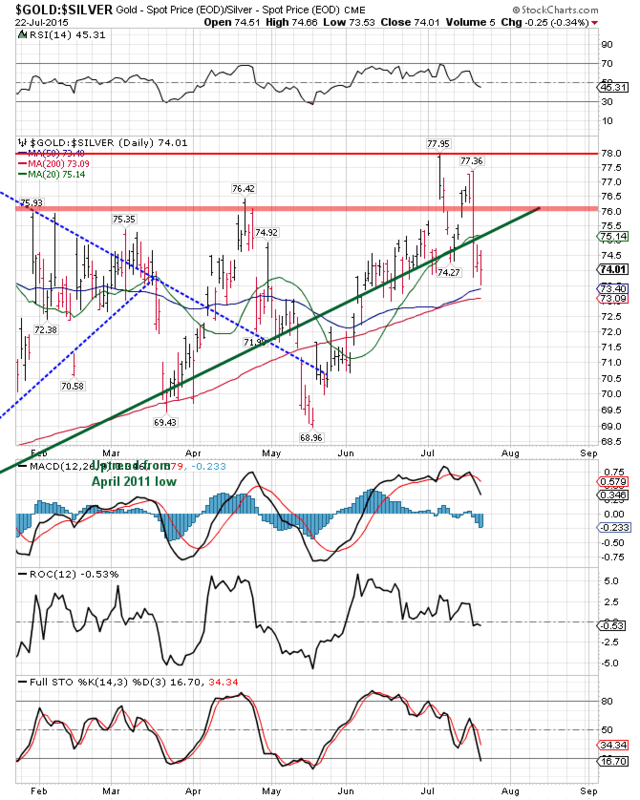 Dollar Index may rise higher later, but for a few days it will be doing penance for previous pride. I’m not going to talk about the euro and yen, they’re just too dull to stand. Euro lost 0.18% to $1.0918 while the yen lost 0.09%. Bonds have been rising the last seven days, so somebody is rolling out of risk and into safety. Listen, y’all, I know it sounds utterly laughable that anybody would seek safety in US dollars, much less US government bonds. I’m not offering the statement for the truth of the matter, but for their state of mind.